1. Meditate. Start with 5 minutes a day and work your way up. You’ll be surprised by how great you feel when you’re done and how easy it is to work your way up to 15-20 minute sessions. Benefits? Increases happiness, reduces stress, and balances the body’s systems. 2. Going on regular walks. Benefits? Going on a leisurely stroll has been proven to improve your mode, slow mental decline (hello, we need! ), and lowers stress. 3. Drink lemon water. We start (or try to anyway) every morning with a cup of hot lemon water. Benefits? Improves digestion, boosts immune system, and reduces inflammation to name a few. 4. Read. It’s no secret we love reading, and as much as we love our reality TV, reading a good book is always so much better! Benefits? Reading reduces stress, improves your memory, and reading before bed improves sleep. 5. Wake up early. It’s rare (and celebrated, let’s be honest) that we sleep in. Sometimes waking up early can feel like a drag but we’re always so much happier when we do. Benefits? Enhances productivity (the earlier you’re up the more time you have to get stuff done), improves quality of sleep, and most importantly…the kids aren’t awake yet ;). I’ve been wanting an original Adidas sweatshirt for a long time, and love the oversized fit of this one. I have it tucked under, but it hangs below the booty if I untuck it all the way – great to wear with leggings! 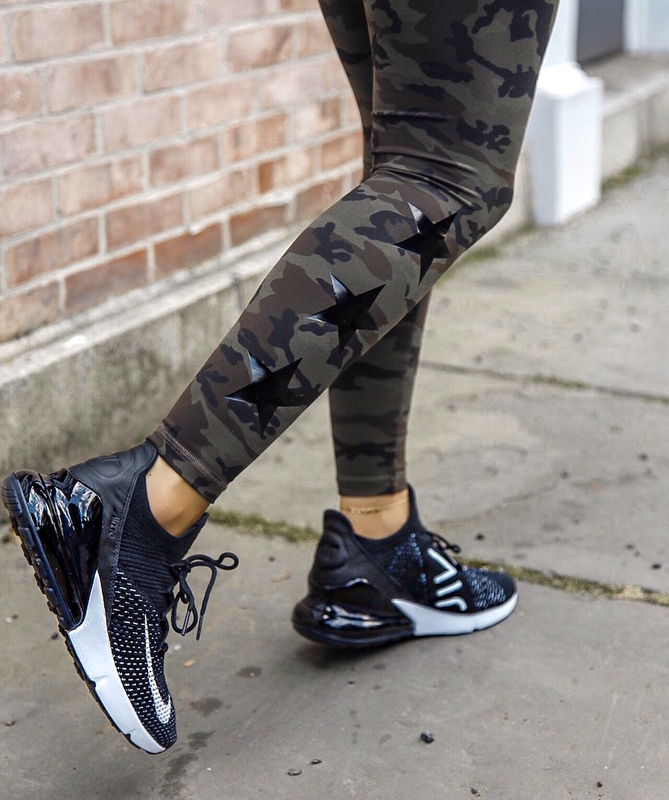 These camo leggings are my new favorites for the gym or running errands. They are so so comfortable, fit true to size and are super flattering. Six:02 has the best stuff in their stores and online. I love visiting their stores because I feel like their buyers are on another level! They always have the best sneaker selection and have fun/different colors I don’t see anywhere else, they just have that cool vibe down. Also, they always seem to have the color combo and sizing that is sold out everywhere else. These Nike’s are the newest release of the 270 and I’m obsessed. 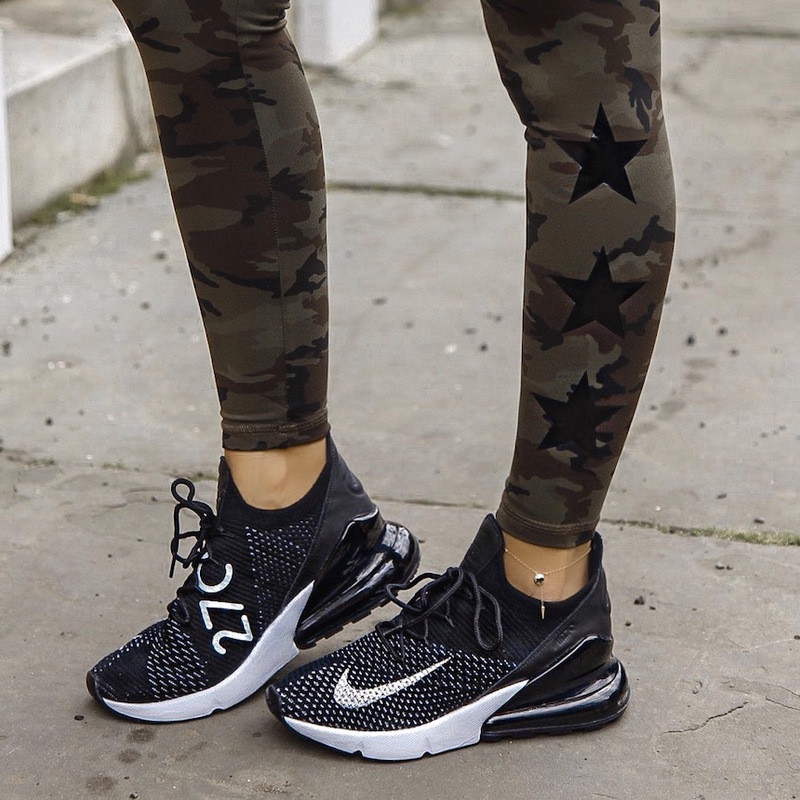 They are so comfortable – I ran sprints in my other 270’s at the gym today. I love the black and white combo. One healthy habit I need to get better at is stretching regularly. I’m so bad with my stretching – I’m always forgetting to do it after a workout, but I need to make it part of my routine! I also want to do more yoga. I just joined a new gym, so I’m excited to try out all of their classes. I love the star decals on these leggings. I agree with Brooke that Six:02 always has the best stuff – like this matching set! 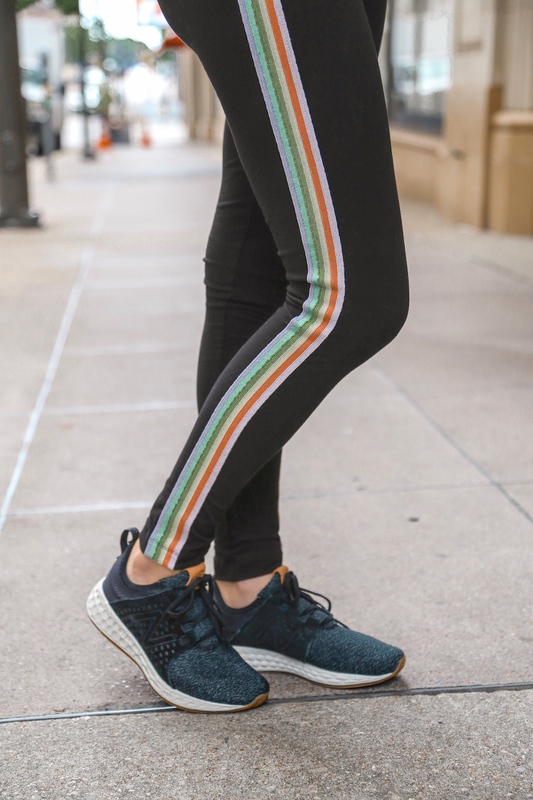 I’m still obsessed with all things rainbow so I couldn’t say no to these leggings and hoodie. The perfect outfit to throw on for errands, the gym, or when you have nothing to wear! I need the matching shorts because I can only stand to wear leggings in the AM with in this Texas heat. It gets soooo hot by the end of the day!! I’m a huge fan of New Balance sneakers! I haven’t worked out in this pair (reallllly need to get back to the gym) so I’m just using them as athleisure wear for now 😉 They’re made with breathable mesh and a foam midsole for support – so comfy and lightweight! And they come in so many colors!! I’m loving the pink and grey too. My bump disappears in some outfits but I swear it’s there. I even felt it (he/she!?!?) kick today for the first time – such an amazing feeling! I love both of your leggings and they have great price tags! I walk a lot and drink lemon water like crazy but I need to work on meditating and reading more often. Any advice for how to get started with meditation?